Grill, roast, fry, saute, and bake - all in one non stick square pan! Grill, roast, fry, saute, and bake - all in one square pan! The Copper Chef Square Pan is the nonstick pan that replaces most of your kitchen utensils. Made of the highest quality, heavy-duty craftsmanship, your as seen on TV Copper Chef pan cooks on all stovetop surfaces. It withstands heat up to 850 degrees so you can take it right from stovetop to oven. Copper Chef&apos;s state-of-the art Cerami-Tech, non-stick coating is leading the way in the new generation of healthy, non-stick technology. Your food will never stick to the pan! So you can cook without added fats or oils. 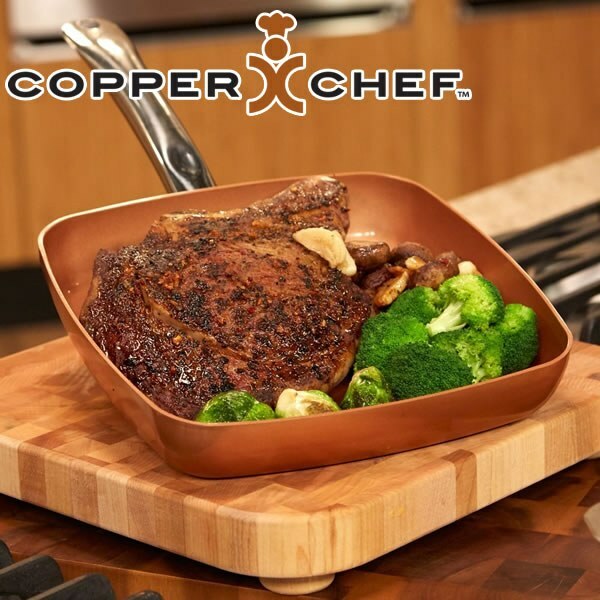 Copper Chef is completely chemical-free so it won&apos;t chip, peel, or flake into your food. Because there&apos;s little to no residue left behind, clean-up is a breeze. No wasted time soaking and scrubbing. Your beautiful Copper Chef pan is dishwasher safe! Perfect for any stove top surface-electric, gas, glass ceramic, and induction - the copper chef does it all! Best pans I have ever bought! We have ordered lots of "copper pans" have enjoyed using them all I want to order some for Christmas gifts.